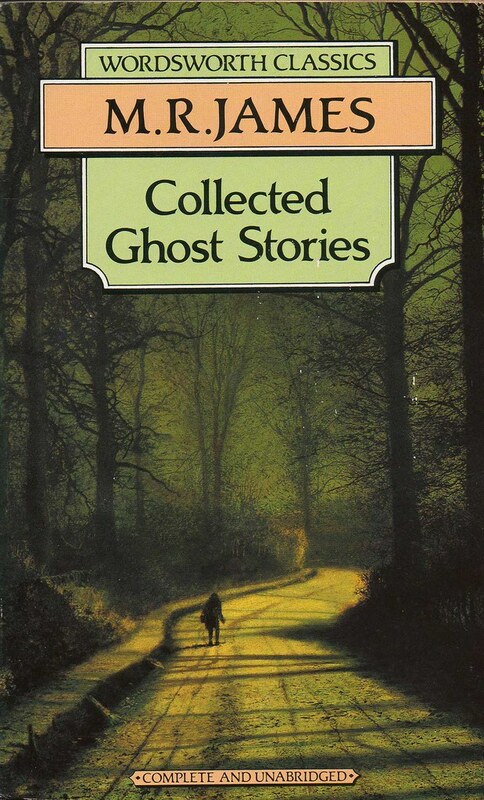 The four volumes of James's ghost stories were collected into one volume in 1931 and have not been out of print since. These four volumes comprise all his supernatural stories of merit, only a few lesser pieces being ommitted. The Residence at Whitminster: When the Earl of Kildonan prepares to take a post at the Lisbon Embassy, he asks Dr Ashton of Whitminster to become guardian and tutor to his heir. The young Lord Viscount Saul is a pale and fanciful youth who quickly befriends Frank Sydall, Dr Ashton's orphaned nephew. Saul's fancy's are of a morbid nature, and he seems to exercise an unhealthy influence on the other youth. It's not long before Frank dies in curious circumstances, and Saul soon follows him to a shared tomb. The Diary of Mr Poynter: James Denton goes shopping for chintz curtains for his aunt, but instead purchases in an auction the diary of Mr Poynter, an antiquarian of the region in years previous. His aunt is not pleased that he's forgotten the chintz curtains, but pinned in the diary they find a sample of cloth, whose unusual design his aunt says will provide a pattern for some very original curtains. Woven into the cloth appear to be long strands of hair, adding to its original design. This one comes to a very chilly conclusion. An Episode of Cathedral History: Mr Lake is to examine and report upon the archives of the Cathedral of Southminster. The Head Verger, Mr Worby, is only too pleased to show off the cathedral in his charge, though he laments the loss of the fine oak wainscotting during the Gothic revival of his father's time, when much fine ornament was stripped from the church. The demolition of the original pulpit had revealed a plain stone tomb beneath, with no identification. One corner of the tomb is cracked open, and from the time of its uncovering the summer turns sickly in the villages around. The Story of a Disappearance and an Appearance: A series of letters from one brother to another, tell the story of the first brother's arrival at a village to learn the fate of his uncle, mysteriously disappeared. His uncle is not much missed, and the police can find no clues; but the brother hears tell of an amazing Punch and Judy show approaching the village, then has a strange dream in which elements of his uncle's disappearance and the day's conversation appear to be entwined. This is one of James' better stories, and despite the rather dull title is imaginative and bizarre. Two Doctors: Some papers in an old book tell the story of the unsociable Dr Abell, and the much-liked Dr Quinn. Dr Abell never attends church and frequents the country lanes by night, where he hints he has seen unearthly creatures. There is some quarrel between the two doctors, which ends when one of them dies under mysterious circumstances. This one just about holds together, though more of an anecdote than a story. A Neighbour's Landmark: On a wet afternoon at Betton Court, two friends fall to talking about the old wood that used to stand on a nearby hill. Walkers through the wood were often disturbed by strange sounds, and although the wood is gone, it seems the land is still not quiet. Another anecdotal piece, notable more for its mood than its story. A View From a Hill: Another re-reading of an old favourite of many years. On a visit to his friend Richards, Mr Fanshawe borrows his host's field-glasses to study the surrounding country. The glasses, he learns, were made by the late, secretive antiquarian Baxter. He is impressed by the view of a distant church tower, but surprised by what appears to be taking place on the old gallows hill. His friend insists that he must be mistaken in what he sees; the church tower is unremarkable, and the hill is now densely wooded. To settle the matter, Fanshawe sets out on a cycling trip through the surrounding countryside. This time, the mood and the storytelling are in lovely balance. An Evening's Entertainment: James recreates the entertainment of storytelling around a winter fireside, as Grandmother tells Charles and Fanny why they must never pick berries at the end of the lane, where a certain house once stood. The house it seems was once occupied by Mr Davis and an unnamed young man, his student. These two were fond of wandering country lanes at night and exploring prehistoric mounds, suspicious behaviour in any self-respecting person's view. There Was a Man Dwelt by a Churchyard: James' completes the story begun by Shakespeare's ill-fated Prince Mamilius. John Poole is a reclusive miser living beside the graveyard. After the unpleasant old woman is buried with her money, people notice that John Poole seems to be much better off. Rats: Beginning with some lines about bedclothes heaving with the rats beneath them (from a story presumably considered too well-known to be named), James asks, what if it had not been rats? Young Mr Thomson stays at a picturesque inn, in the Suffolk countryside to spend some days walking and writing. He learns of an old gallows pole taken down years before by fishermen, because they could see it from their boats and believed it kept away the fishes. His holiday is pleasant and productive until one boring afternoon when he borrows the keys from the desk to explore the empty locked room close by his own. After Dark In The Playing Fields: A rare treat this one, as the wanderer in the playing field on Old Midsummer's Eve speaks with an owl and encounters the horde of the Fairy Queen. Wailing Well: Written to be read at the campfire of a scout troop, this tells the tale of the reprehensible schoolboy Stanley Judkins, who refuses to take note of the old shepherd's warning concerning the well at the heart of a copse, where three ragged figures have been seen treading paths through the wood. This one includes a hilarious and deadly take on the Eton wall game, and in the end is one of the stronger stories among these later pieces. Stories I Have Tried to Write: A brief self-explanatory piece, none of the unfinished stories mentioned really much of a loss. Impossible really to pick favourites from so many great stories. This Wordsworth Classic paperback is well produced with decent size print, and a cover print of John Atkinson Grimshaw's painting Moonlight Walk, particularly well-chosen as the solitary figure making its way along a moonlit woodland road has a pleasing ambiguity; is he walking away from, or towards us, and are his shoulders bowed with age or apprehension? Other stories in this collection have been read and reviewed for other collections, and those reviews will later be added here. Those titles include Canon Alberic's Scrapbook, The Mezzotint, The Ash-tree, Number 13, Count Magnus, 'Oh, Whistle and I'll Come to You, My Lad', The Treasure of Abbott Thomas, The Tractate Middoth, Casting the Runes, The Stalls of Barchester Cathedral, Mr Humphreys and His Inheritance, The Uncommon Prayer Book and A Warning to the Curious, which I read previously in the Ruth Rendell-edited collection A Warning to the Curious. Also previously read in James' own collections, Ghost Stories of an Antiquary and More Ghost Stories, are Lost Hearts, A School Story, The Rose Garden and Martin's Close. A website should be useful to the people browsing it, so here are some related pages on other sites. If you've found this site useful, please bookmark it.